With the in-laws coming to town on Christmas Eve and plans to wake up in a guest house near the airport on Christmas morning in a land where breakfast is just as pungent and savory as every other meal of the day, I decided it was an absolute must to have something delectable prepared to enjoy after opening stockings and making our way into Seoul. So, on the night of the 23rd I got to work on a few 'Christmas' dishes: Eggnog and Spent Grain Crackers for when we made it back to our house, and these pefectly seasonal Gingerbread Scones. Combine 2 cups Flour, 2 tsp. Baking Powder, 1/4 tsp. Baking Soda, 1 tsp. Cinnamon, and 1 tsp. Ginger in a bowl. Cut in 7 Tbsp. Butter with a pastry blender of two knives until crumbly. 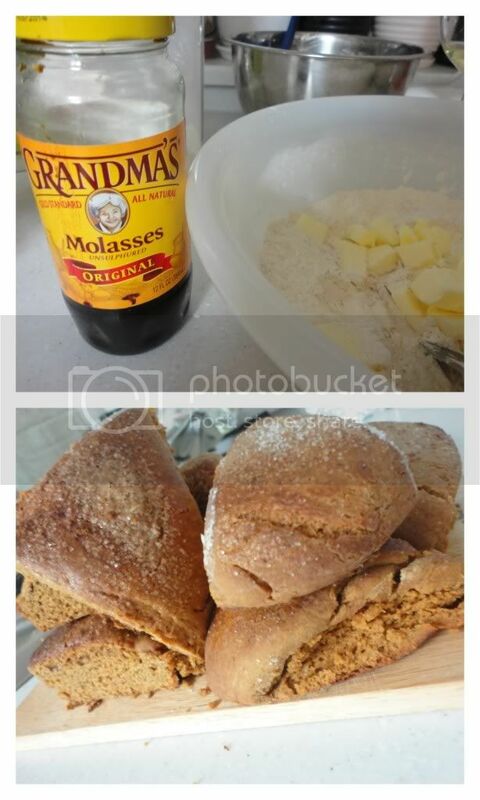 Combine 1/3 cup Molasses and 1/3 cup Milk; add to flour mixture stirring until just moistened. Turn dough out onto a lightly floured surface; knead lightly 4-5 times. Divide dough in half; shape each into a ball. Pat each ball into a 5-inch circle on an ungreased baking sheet. Cut each circle into 6 wedges, do not separate. Bake at 425 for 10-12 minutes, until lightly golden. Enjoy as a Christmas morning treat with family while exploring your stockings!